Children need practice writing their numbers and tracing is the best way to get in that practice. 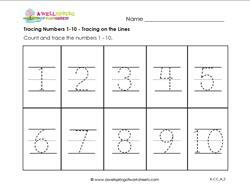 These tracing numbers 1-10 worksheets provide dashed lines for number tracing in a traditional manuscript. Count the objects, count the dots, read the number words, and trace the numbers. Remember, all numbers should be written from left to right and top to bottom. For even more practice, have kids say the numbers out loud as they write them. If nothing else, it will help them with rote memorization of number order. Please go to this page to see all the kindergarten number worksheets on this site. Trace the numbers 1-10 neatly and carefully. Count and color the objects. 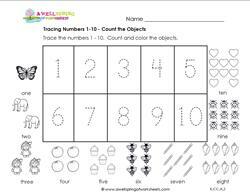 This tracing numbers 1-10 worksheet is sweet and simple. Trace the numbers 1-10 in pencil or in rainbow colors for even more practice. 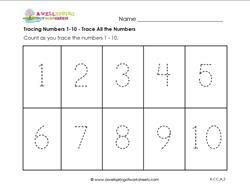 This tracing numbers 1-10 worksheet is as simple as can be. 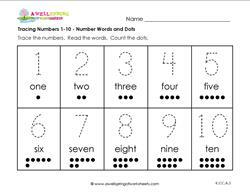 Write the numbers and count the dots to reinforce counting skills. 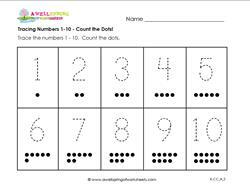 In this tracing numbers 1-10 worksheet kids have three things to do...count the dots, trace the numbers, and read the words. Kids trace the numbers 1-10 on the primary writing lines neatly and carefully. Trace in rainbow colors for even more practice.